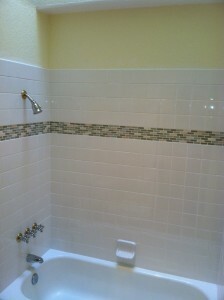 We tiled this modern master bathroom in Temecula recently. 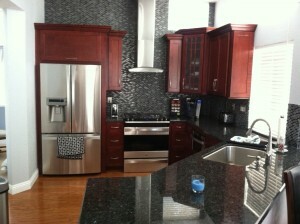 Our customer was very pleased with the clean style and look created. The wall tile in the shower is 3″x6″ subway tile from Dal Tile. The recessed niche,shower floor and wainscot were tiled in 1/2″ glass mosaic. 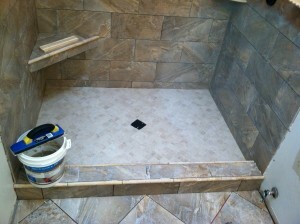 The bathroom floor is 12″x24″ porcelain. 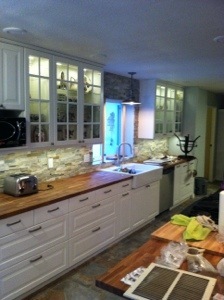 The finished result was perfection! 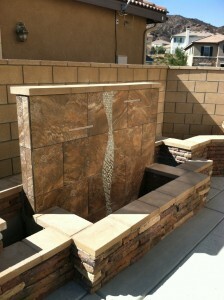 Hamilton Tile and Stone received a call recently to fix a leaking fountain in Murrieta. We ground the old mortar off, grinding completely back to the concrete block wall. The block was skim coated with Laticrete 254 Platinum and allowed to dry. 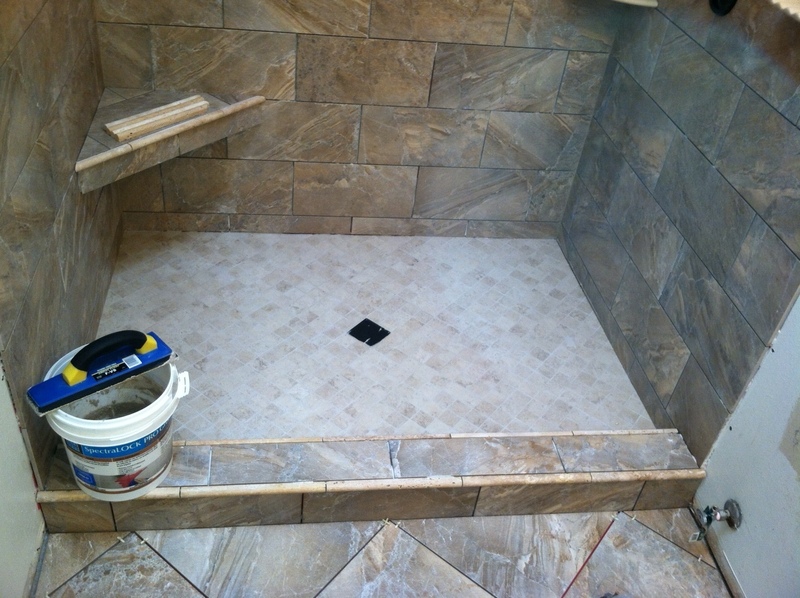 Next, we applied Laticrete Hydroban to waterproof the surfaces to be tiled.The porcelain 16×24 Dome Rust and SL Harvest Melange glass from Arizona Tile were then installed with Laticrete 254 plantinum and grouted the following day. 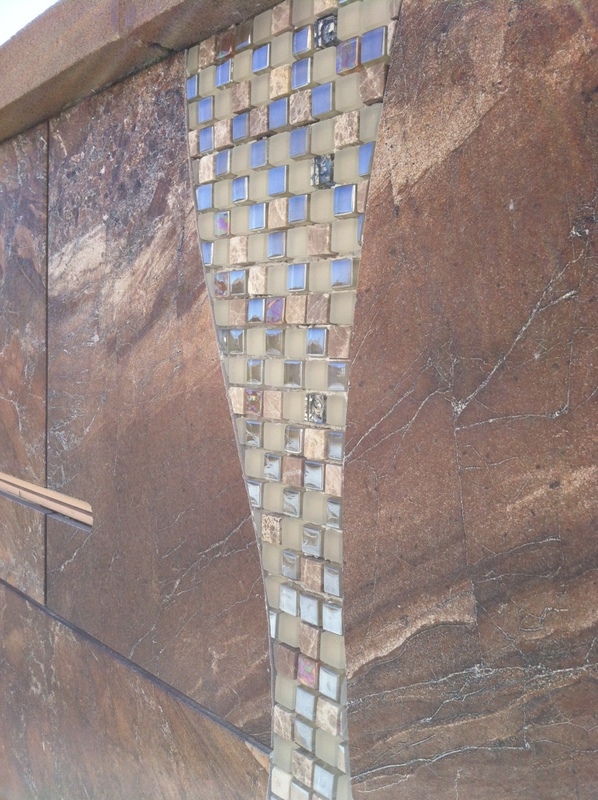 Considering our customers had just gone through a bad experience we added a creative ribbon of glass mosaic for a classy modern look. When this back yard is landscaped it will have a peaceful feel with the sound of water and a ton of style. Schluter’s Kerdi shower system is an affordable alternative that creates a 100% waterproof shower. 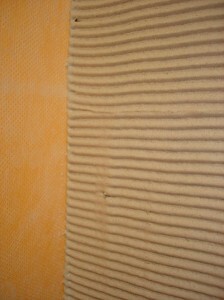 Kerdi is an 8 mil thick sheet membrane with a fiber fleece laminated to it. Not only is it water proof, it is also vapor proof which gives it an advantage over other products when building steam showers. 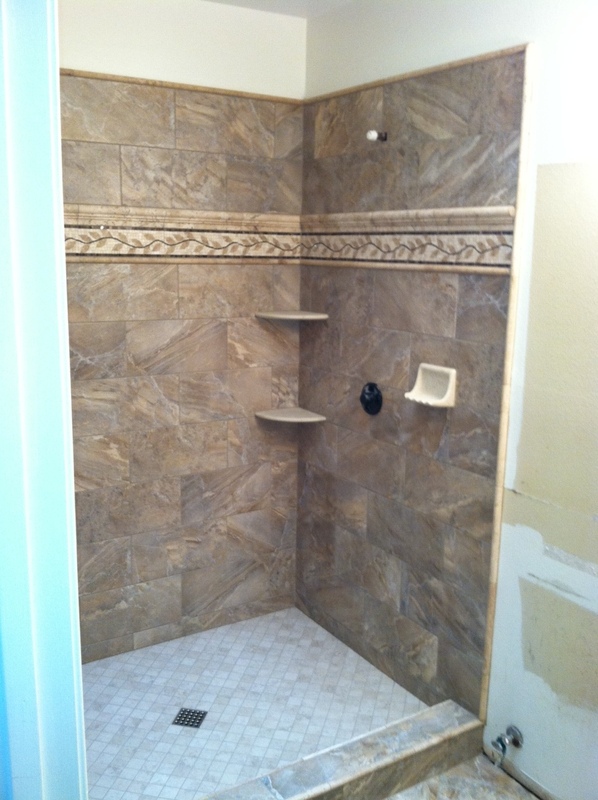 The Scluter Kerdi shower system comes in a kit.The components can also be purchased separately. The photo shows some of the different parts of the kit. Thinset is troweled evenly over the substrate just prior to embedding the Kerdi membrane. 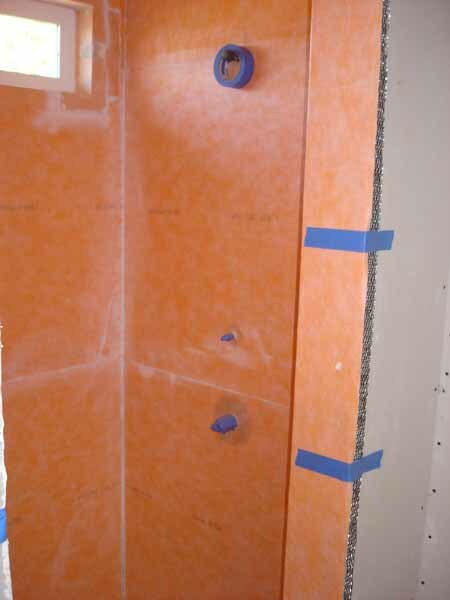 The shower walls are covered completely in Kerdi and the pipe protrusions are sealed with Kerdi Fix. 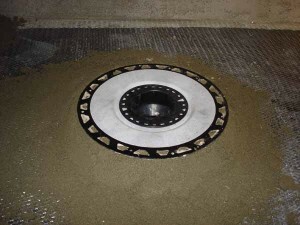 Here the drain is being coated with thinset just prior to adding abs glue to make the connection to the shower’s p-trap. 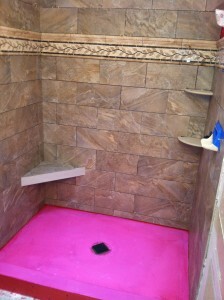 The drain is connected to the drain pipe and the shower floor is floated with drypack mortar and allowed to dry. 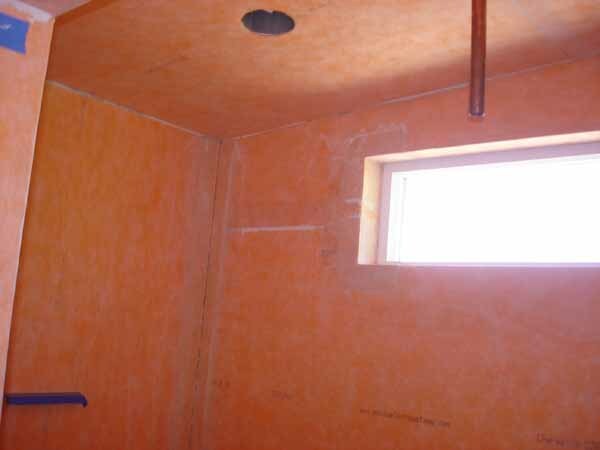 In this steam shower the ceiling was waterproofed as well. 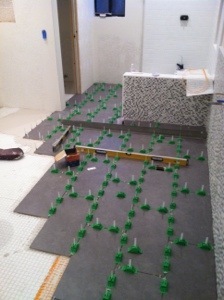 After the Kerdi is installed you are ready to tile! Hamilton Tile and Stone recently completed this beautiful shower in Lake Elsinore Ca. 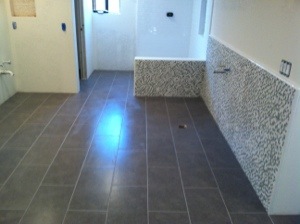 Our customers selected this nice porcelain tile from Arizona Tile in Murrieta. 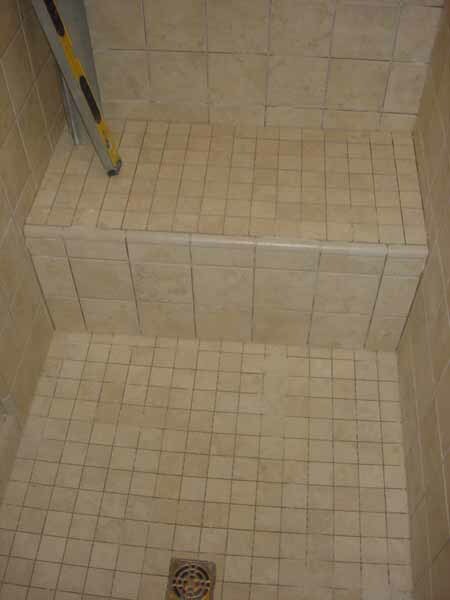 The porcelain wall tile is placed into the polymer modified thinset for a permanent bond that will last for years and years. 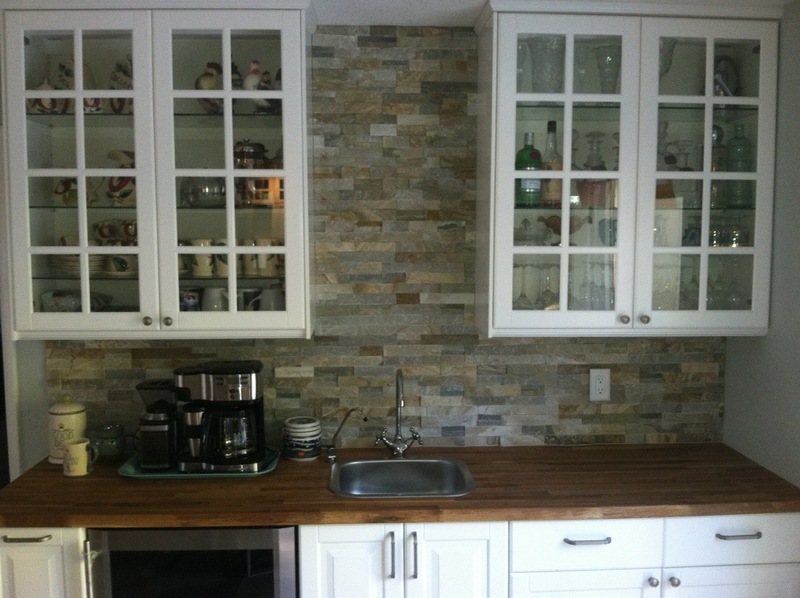 Modified thinset is required to bond porcelain due to its extremely low absorption rate. 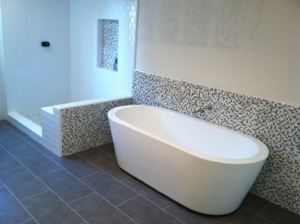 In this shower the client selected the Better Bench. 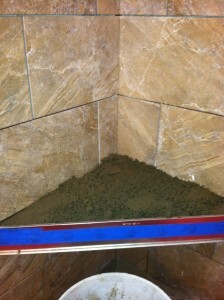 This stainless steel bench is filled with drypack mortar before installing tile. 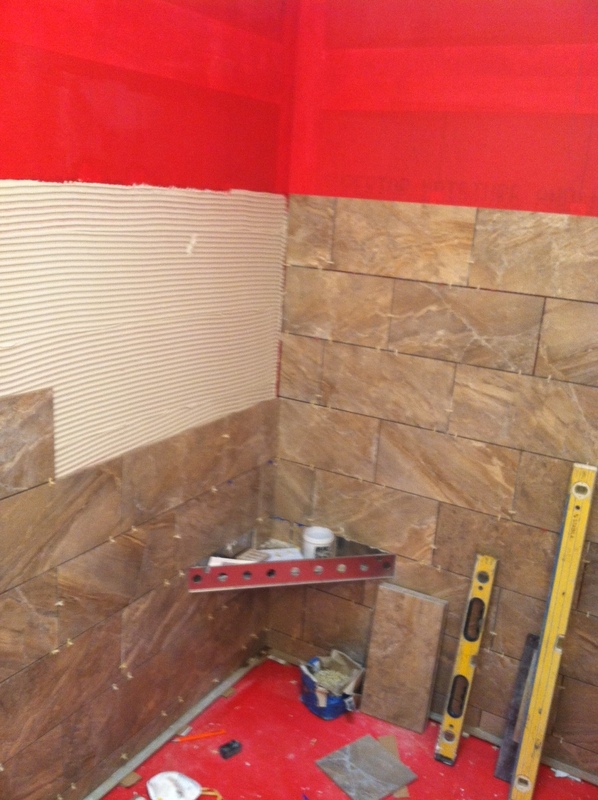 After installing the wall tile and accessories the floor is given another coat of water proofing and allowed to dry. 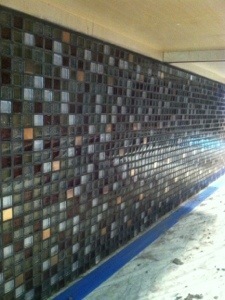 After everything is dry we grout with sanded polymer modified grout. Our customer selects the color of their choice. 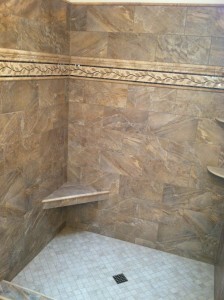 This shower is complete and ready to use after a 24 hour cure. What a nice transformation. 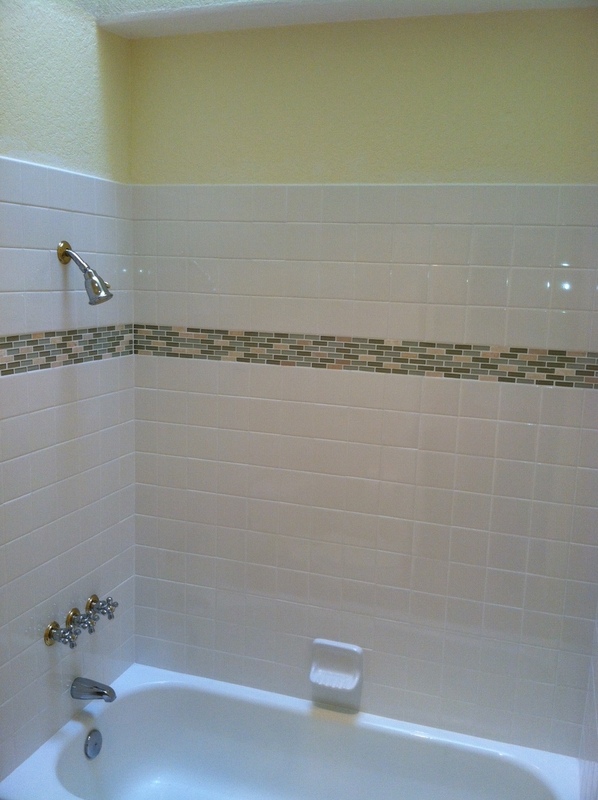 This space used to hold a cream colored fiberglass shower with a bath tub. Buy converting to a shower we have created a much roomier shower with more floor space and ample room for a bench. 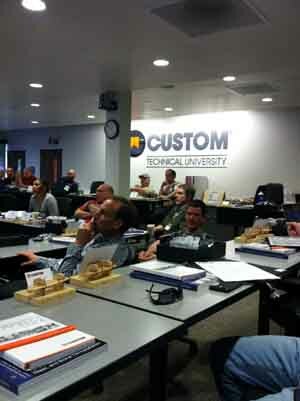 Sun March 3 was the first day of a 4 day training event held by Custom Building Products at their new facility- Custom Tech University. 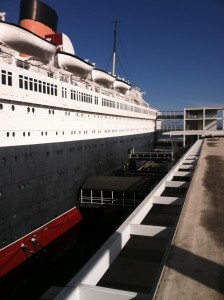 We were instructed to meet at the Queen Mary as that is where they put us up. Our group consisted of approx 30 people from around the country. Some flew in early, while others like myself who were able to drive waited a little longer and got there around 3 pm. 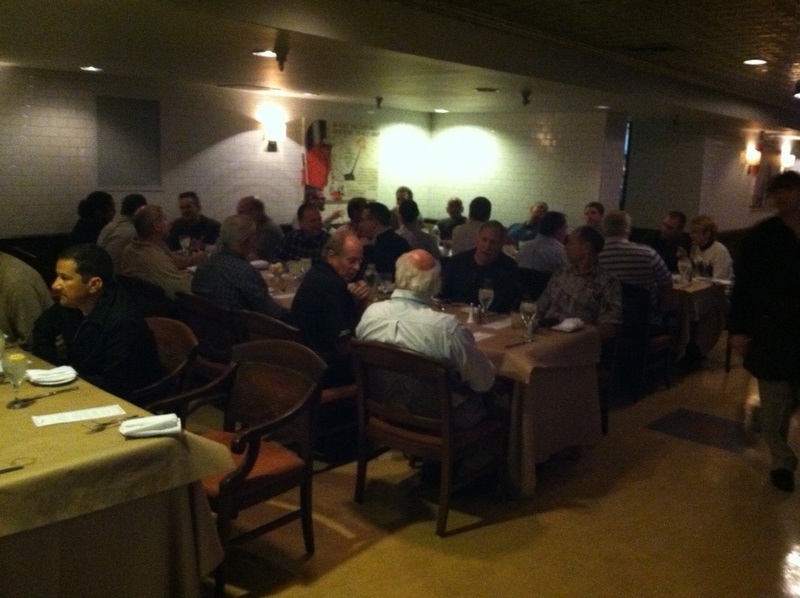 After checking in we all met for dinner at the Chowder House aboard the ship. It was really nice seeing old faces and meeting a bunch of new folks. 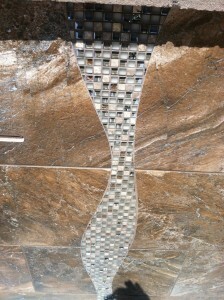 The folks I mention are some of the best tile installers and contractors from around the country and Canada. We all chat online together on the John Bridge tile forums, but it is really nice to put names to faces and have in person conversations. Mon. March 4 we all met for coffee before boarding the bus to head to class at CTU. After waking up a little we made the trip across town to the new CTU facility. I wouldn’t be exaggerating when I say every one of us were thoroughly impressed. 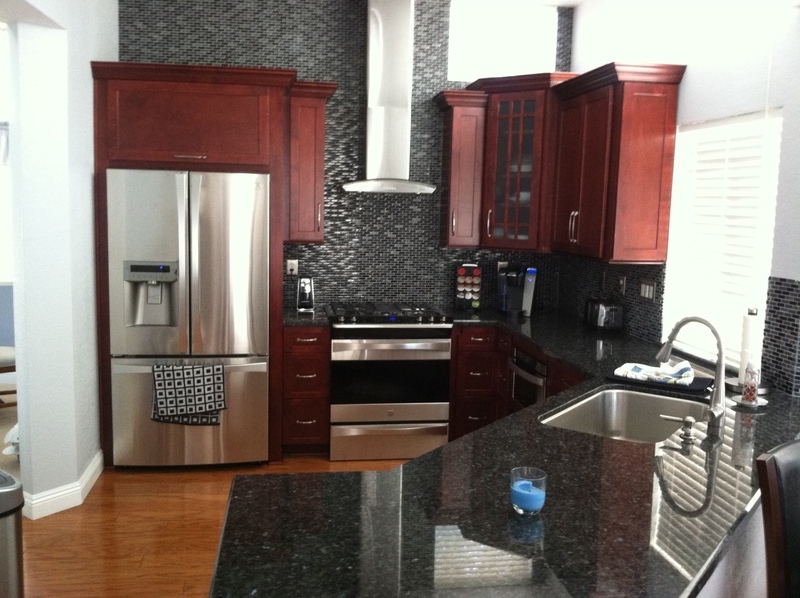 The facility boasts of a well thought, clean professional design….truly reflecting the staff. First up after our introductions was a discussion on surface preperation, which lead into underlayments. 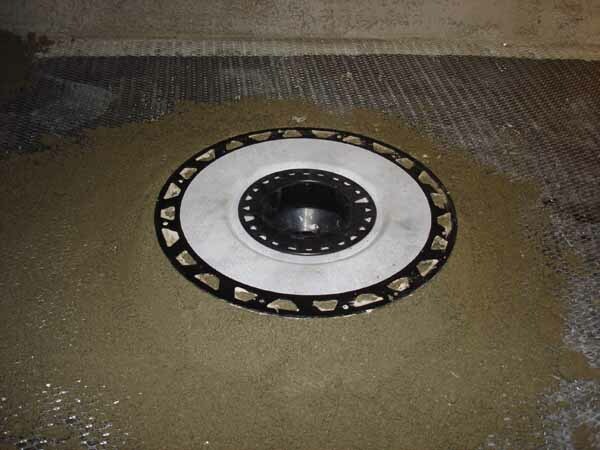 CTU introduced products(Spiderweb2 and Easymat) and went through each one, how and why they work. 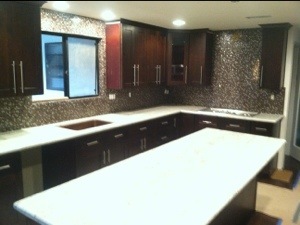 After talking about them for 45 minutes we went to the demo room and installed the products on mock up substrates. It was nice to see the evolution of the Spiderweb 2. We played with Silk at this time also, which is a feathering mortar designed to go from 1″ to 0. After lunch we were taken on a tour of the technology dept. Sorry, but no cameras were allowed in this top secret area. It was really interesting to learn about the tools they use in their laboratories. Basically, products are stressed to their breaking point. 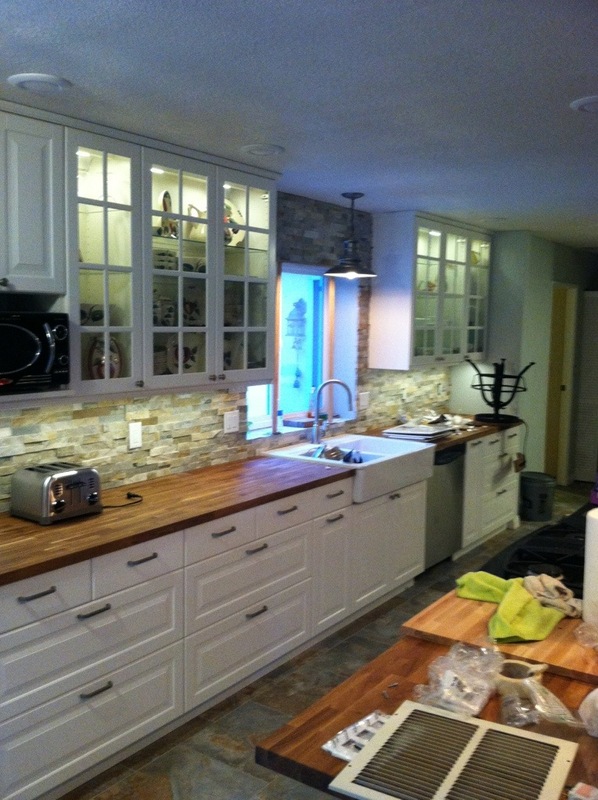 The data is compared to the standards set by the American National Standards Institute. Also in the underlayment category were their line of self leveling cements and Redguard. After discussion in the conference room we went back to the demo room for more hands on fun. Level Quick and Level Quick RS are self leveling cements designed to be poured out on to an uneven surface and flatten it in preparation for floor tile. Redguard is a paint on liquid applied waterproofing that when dry remains elastic and waterproof. 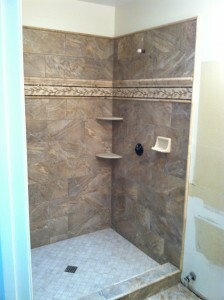 Tues. March 5 CTU introduced us to their new installation system products for showers. 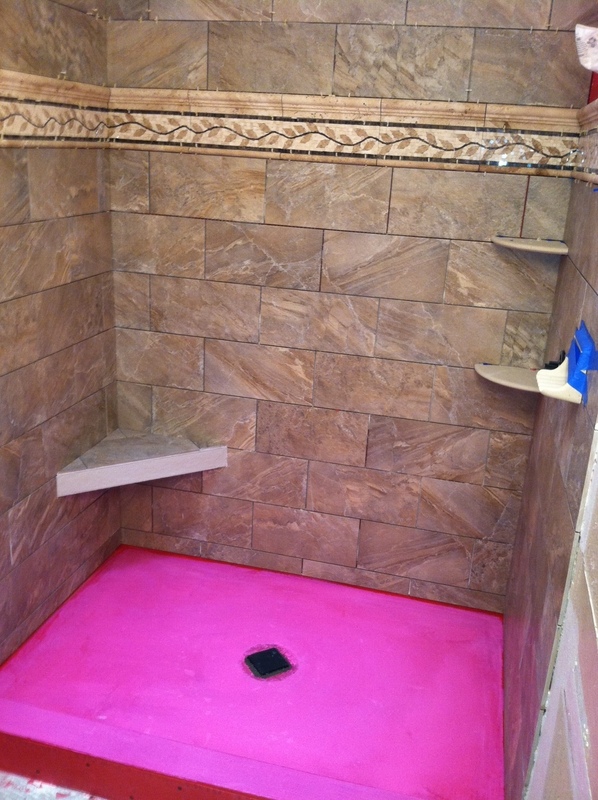 We went across the property to their big demo room and installed a premade shower pan, the curb and cement walls along with a recessed niche and bench. What is really interesting is the move in our trade towards products incorporating high density Styrofoam. Up next we got a quick introduction to their brand new edge profiles and reducer edgings. These are popular in a lot of commercial tile applications and gaining ground in some areas of residential remodel. 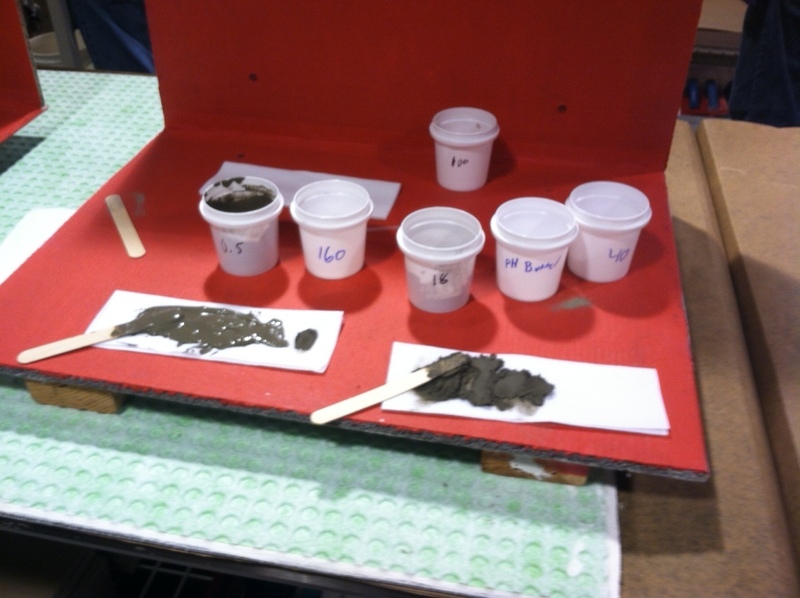 The next few hours took us into an in depth discussion on setting materials. 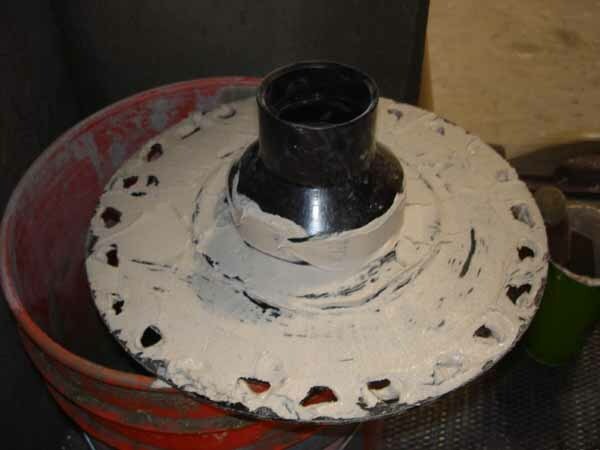 How mortars bond, why they wont bond….the technology involved at the microscopic level and a back and forth to the demo room to play with the products. Mid afternoon we discussed sealing products. We were given a very nice presentation about the science of sealers and how they work. Also, maintenance and care. After discussion we went back to the demo room to see first hand for ourselves how these products function and the differences between them. Finishing out the day that afternoon CTU opened the floor for a round table discussion where they asked us for our opinions, concerns and any ideas or suggestions we might have for future products. It was nice to be able to voice our opinions directly to the manufacturer. It was obvious their concern was sincere in their efforts to improve. Weds. March 6 Today we started off discussing grouts. There are several types and not all perform the same. 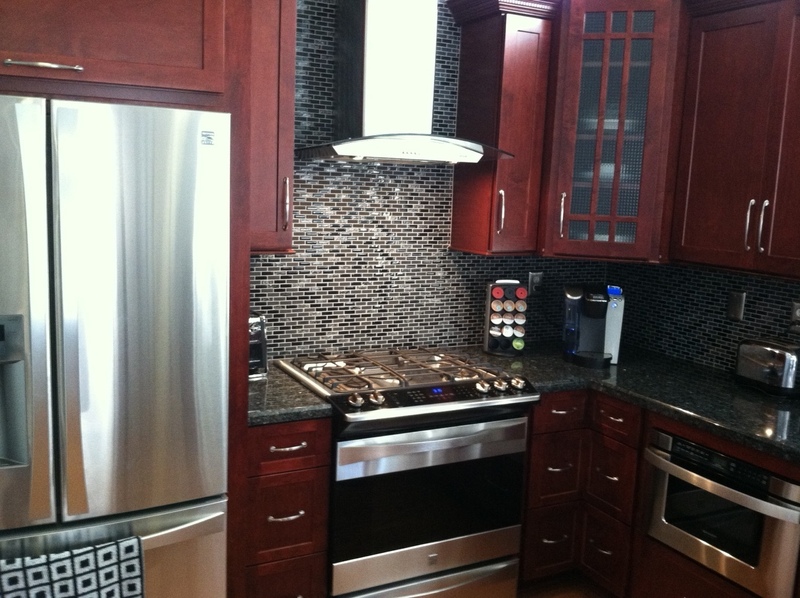 From standard cementious grout, and urethane grout to epoxy grout, all were covered and exlplained in depth. 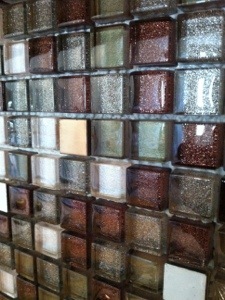 Back in the demo room we got to test CBP’s new high performance grouts:Prism-Fusion Pro- and CEG lite. Honestly, I liked them all. 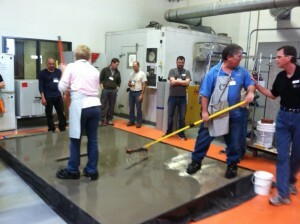 I was most impressed by the CEG lite epoxy grout. Super easy clean up for epoxy. 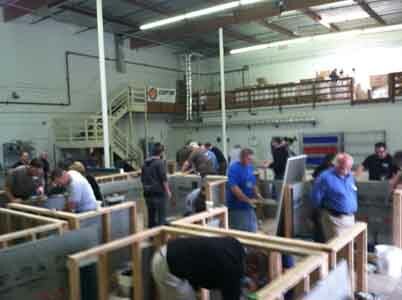 Wrapping up our seminar we discussed Warranties. 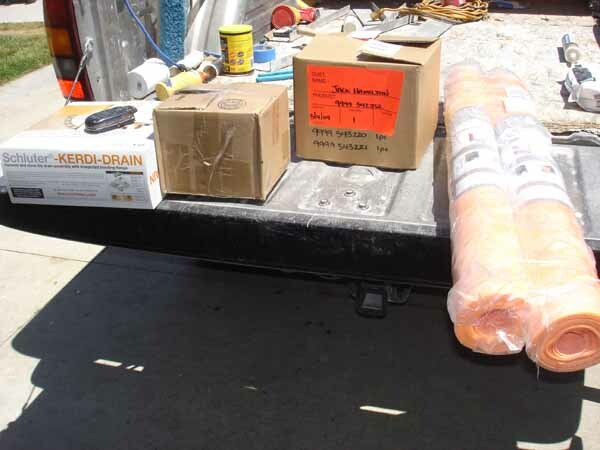 How technologies from different companies don’t always mix well on site, liabilities and how to assure our customers that when they are in the market for a full system warranty to stick with one manufactures line of products, even if those products aren’t CBP’s! This was truly a top notch event. 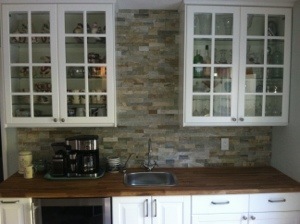 Many thanks to the folks at Custom Building Products and John Bridge and associates.